I have a reason to cover a special cantilever with an aluminum cantilever. 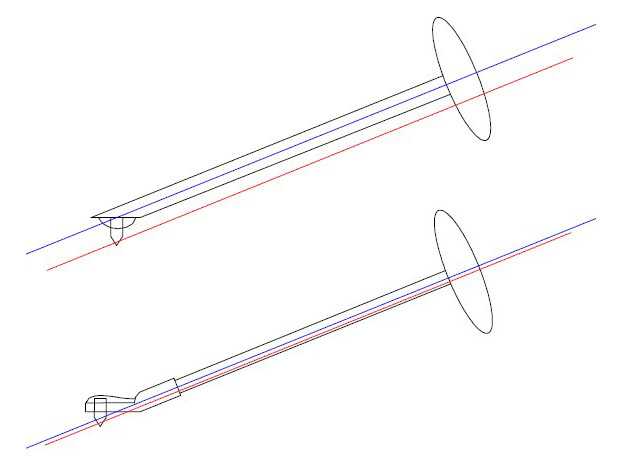 My ideal is to bring the tip of the stylus close on the extension of the center of the special cantilever. Vibration is handed down to a special cantilever from a stylus definitely. I selected that I covered with an aluminum cantilever to bring the tip of the stylus close to the center of the cantilever as much as possible. When a stylus is bonded to the tip of the special cantilever directly, the tip of the stylus deviates from the center of the cantilever. The vibration of the stylus gives a turn to a cantilever, and the cantilever produces a distortion. It is a great many styles in a general high quality cartridge.